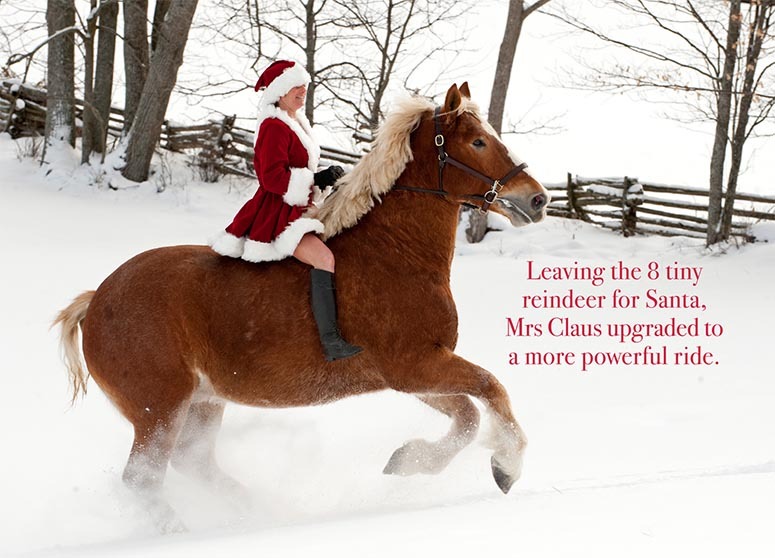 Front: Leaving the 8 tiny reindeer for Santa, Mrs. Claus upgrades to a more powerful ride. The "more powerful ride" pictured is 8 year old Belgian mare Stoney Lake Jaki. She's owned by Drain Brothers Construction, and has been the swing mare for her 6 horse hitch since she was 3. She lives at Stoney Lake Belgians in Lakefield, Ontario, Canada. Mrs Claus is Nancy Robertson. Photographer Laura Cotterman is located in Virginia's hunt country. Laura has been in and around the horse business for 30+ years breeding and training race and sport horses. She lives in Delaplane with her husband Mark, who is a farrier.